After making a start on the Witton Weavers Way series of caches last weekend, I could not wait to get some more found so decided Thursday would be perfect for the next section we were looking at – the Tacklers Trail. I wanted to make an early start so decided to stop overnight near Darwen, which also had the added advantage that I could try and clear up the 6 DNF’s on the Warpers Trail from last weekend. Finally, there was a NW Caching event at a pub near Chorley, so I would get the chance to go to my first one of these meets. I didn’t set off from home until 7pm so it was very dark (and cold!) when I arrived at the first of my DNF’s. This time it was a quick find as I’d found out from a previous finder that the clue was ambiguous. I then moved on to find two of the other DNF’s but still could not find Bumble Bee, despite speaking to two previous finders, one of whom would especially know where the cache was ;-). It was 11:30pm so I headed off for the hotel. After a quick breakfast and taking a wrong turn in Blackburn, which resulted in a bit of extra mileage, I was at the Tockholes Visitors Centre for the start of the Tacklers Trail. I’d decided to tackle (sorry!) them in an anti-clockwise direction, so set off down into the woods to start the trail. The first cache had a back-to-front hint, so when I took the absolute reverse of what it was telling me, I had a quick find. The next was easy enough and in a great little spot in the woods by a nice stream. Then things started to go wrong and I struggled at the next two caches with the heavy tree cover and vague clue on the second one. I got there in the end though. As I came out of the woods my spirits were lifting as I knew the next section of the trail was on moorland, which is some of my favourite type of solo caching as it’s really peaceful and the views are fab. The rest of the trail was uneventful, with quite a few stops to sit down with a cuppa admiring the views, lots of easily found caches and great co-ords for each cache. I’m really enjoying this now. All too soon I was up at the Jubilee Tower, overlooking Darwen. I’ve often looked over at this as I’ve been passing in the area so it was great to see it close-up. 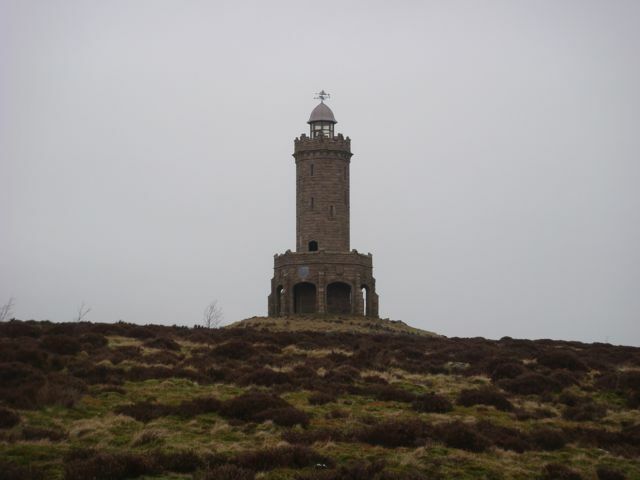 Even better, it’s open to walkers so you can climb to the top for some stunning panoramic views :-). After coming down the other side of the hill, I missed the path into the woods and ended up asking a local getting into his car outside his house for directions. He was really helpful and suggested I go through his back garden into the woods so as to save a pretty big diversion on my tiring legs. A few more easy finds, before struggling a bit with a cache hidden in the ‘cachers enemy’ just before I got back to the Jeep. Persistence paid off though and I soon put my hands on it. It was still light and I had a couple of hours to kill before the event so decided to pop back down to the Warpers Trail to clear up the remaining DNF’s from last weekend. I took the short-cut though the woods and down the steep hill to Turton / Entwhistle Reservoir and soon found the two DNF”s we had there. I’d had a tip off during the day that Bumble Bee had been re-located and was given the new co-ords and hint. I returned under the cover of darkness again and had a quick find – phew! I was beginning to think we’d never find this one, with 2 DNF’s already under our belt. Finally, it was a drive up over the tops though the fog and round to the pub the event was being held at. I’ve never been to an event this far north so did not know a lot of people there. Not a problem though as everyone was really friendly and welcoming and I was soon chatting with lots of cachers I’d seen signed into the various logbooks we have found on our travels. I was planning an early get-away from the even but it was not until after 10pm that I left the pub! The drive home was easy as the roads were nice and quiet. A great day and a bit out, with some of the very best type of caching along the way. The Tacklers Trail is now our favourite on the Witton Weavers Way. 43 finds in total :-).